No need to make an advertisement for Las Vegas, the world gambling capital. The geographical position next to Los Angeles and San Diego, the enormous investments, its climate and nearby water and abundant energy made possible the transformation of the simple ranch into the agglomeration with approximately 2 millions inhabitants, 70% of the population of Nevada. Games, lights, all-you-can-eat buffets and free parking. Las Vegas is an enormous amusement park, the city of excess entirely dedicated to entertainment. Its cheap hotels and casinos open 24/24 make Las Vegas a dream affordable for middle classes. This oasis lost in the desert of Nevada may also be a perfect place for a gilded retirement for the well-heeled. It is also a place where you can easily make a round-the-world trip: on your right there is a brand new Egyptian sphinx, on your left, the Eiffel tower and on the background, a Venetian style palace… It is an incredible experience enabling you to better understand the essence of America. Discover the famous Las Vegas Boulevard bordered by the biggest hotels-casinos in the world. Enter in the Caesar’s Palace, admire the incredible museums of the city, watch the superb show in the casinos and visit the region. If you have suddenly fallen in love during the vacation trip, lucky enough it happened in the city where marriage can be registered in a few minutes. No need to be the resident of the Nevada state, just proof that you have turned 18 and, if necessary, that the divorce has been been pronounced (even in Las Vegas the polygamous marriage is not allowed). Choose a theme of the celebration - Egyptian, knights, Venetian romanticism - to live the unforgettable moments of your wedding. Did we forget anything? Gamble of course! Find cheap flights to Las Vegas and enjoy your journey! Airport McCarran where more than 1000 one-armed bandits are waiting for the tourists, ranks 24th in the world by passenger traffic. It is the 8th in terms of aircraft movements with more that 520 000 takeoffs and landings of international and domestic flights. There are also smaller Henderson Executive Airport and North Las Vegas Airport used mostly by general aviation traffic. Search for cheap domestic flights and book online. Las Vegas is so popular tourist destination that there is simply no "dull season". The busiest time is during New Year’s holidays, July 4th and school vacations. As Valentine's Day is a popular date for wedding, usually there are many couples coming to the desert in Nevada to quickly get married. Any time of the year Las Vegas is rather huddled and the weather is stable dry and sunny. If you are planning to swim and sunbath, the perfect weather is awaiting for you from May to September. Spring and fall are perfect for walking the Strip or exploring the surrounding desert. cheap flights to Las Vegas and enjoy your journey! Mobissimo has multiple ways to help travelers find cheap flights to Las Vegas. You can subscribe to our weekly cheap flights and deals newsletter which includes great deals on cheap flights. We provide an Airfare Index that you can subscribe to on our front page which will alert you to the cheapest flights to Las Vegas via RSS. When your search on Mobissimo is finished we provide a recommendation box with dates when the flight to Las Vegas is the cheapest. There's our Facebook page where you can connect to people who are looking for great deals to Las Vegas and where we also post cheap flight deals regularly. Our blog provides highlights of sales on flights on major carriers. We also have a flights deals page that is updated daily. If you're looking for cheap domestic and international flights to Las Vegas, USA , it helps to be flexible with your travel dates. Being able to leave on a Thursday or come back on Monday, and taking early morning flights, will help you find cheaper flights than the busy and popular early evening flights and late afternoon flights for Las Vegas. 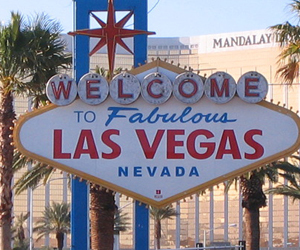 Searching during the travel off season for Las Vegas will also help you find the best fares. Keep in mind to search for the cheapest flights to nearby cities airports. Mobissimo is the ultimate travel search engine for all USA destinations.